Connecting Research: The Forum · What have insects ever done for us? 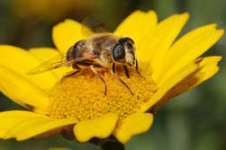 How has the wet weather of the last couple of months affected the UK’s insects? I’ve noticed an increase in flies; is this related to the weather? Undoubtedly these weather conditions will have affected UK insects. There are always winners and losers when the weather is unusual and many species of fly may have benefited. Certainly we have encountered a high number of tabanid horse flies which have been pestering us while we are trying to do fieldwork! With regards to crop pollinating insects, which we are particularly interested in, numbers visiting flowers of some of the crops we work on have certainly been down on last year. Perhaps the poor conditions in April and May reduced the bumblebee queens ability to forage so nest establishment and worker production may have been delayed. We may not then see higher numbers until later in the summer compared to last year. Thanks Michael. Aren’t the tabanids pollinators? So perhaps the increase in their numbers will benefit flowers and crops.